On other trips out west, I have seen these trees from the car and have been awed by their beauty. In June, I got to spend a night camping by an aspen grove and then hiked through them on the way to the summit of Mount Elbert. When I first read about the paths to the summit, I thought there were many reasons to choose the southern route. The trail is shorter if you can drive to the end of the four-wheel drive road. There is plenty of free camping along said road. 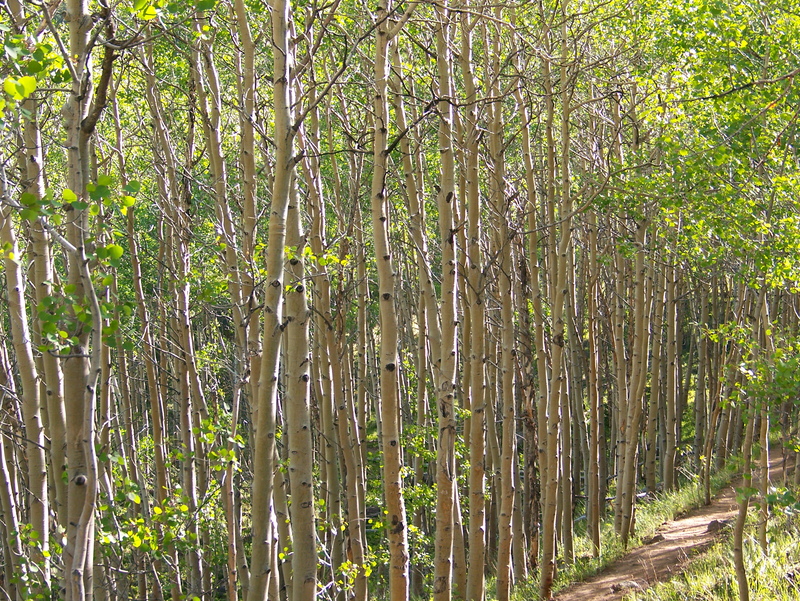 And the trail begins in an aspen grove. The light was playing wonderfully on these trees on both the hike up and down, thanks to the length of time it took me to get to the summit. It was around 6 p.m. at the time of this photo, which created warm hues and lots of shadows. I even learned a couple interesting facts about these trees. First, they are not at all similar to birch trees, even though that is what I thought they were when I first paid attention to them along the Pacific Coast Highway in redwood forests in California. Second, the trunks grow from the roots of the original seed, so really, theses are all one tree. The root system can live for thousands of years, sending up new sprouts as other trunks die. This entry was posted in North America, Photos, U.S., Wednesday photo and tagged California, Colorado, Hiking, Mountains, Pacific Coast Highway, Photos, Travel, Trees. Bookmark the permalink.